1929 1929 8 pp. with portrait of Eugene O'Neill on the inside front cover .Promotional pamphlet for a 'one evening only' performanceat the Grande Theatre, Salinas Kansas, on January 23rd, year not stated but believed to be 1929. 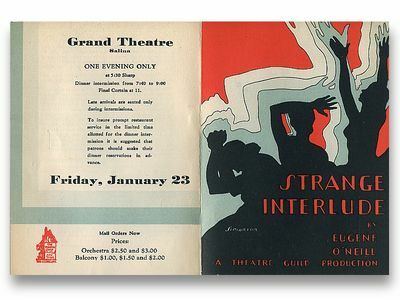 Eight pages of reviews of 'Strange Interlude,' including reviews by Joseph Wood Krutch, Brooks Atkinson, and George Jean Nathan. Back page has ticket prices $1.00 -$3.00) and a note that the produuction would break for an hour and a half dinner intermission and that it would be best to make dinner reservations in adfvance. 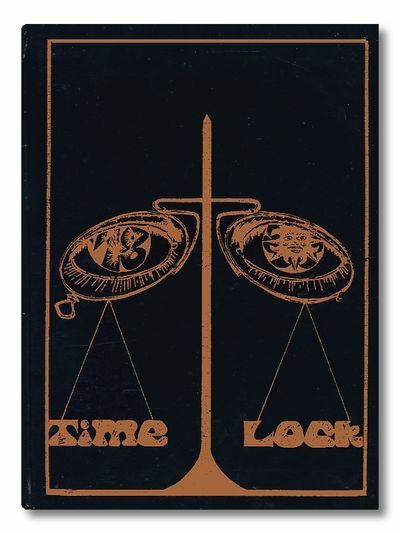 Cover has a red, grey and black sillouette drawing. Stapled Soft Cover. Near Fine. 4.5" x 6.25". Pamphlet.. Hardcover. Near Fine. Detroit: General Motors Corp., 1973 Original owners manual plus assorted pamphlets in "as new" condition in a clear plastic wallet, now rubbed and yellowed.. Soft Cover. Fine/Good. Dust jacket present. 1976 1976 52 pp plus an envelope of photos of what appears to be the senior prom. Hard Cover. Very Good/No Jacket. 4to - over 9¾" - 12" tall. Privately Printed.. Hardcover. Very Good/No Jacket. 1968 58 stapled typed pages with additions in pencil. First and last pp yellowed, otherwise clean.. Stapled Soft Cover. Good. 8 1/2" x 11". London: W. Peacock, 1795 London: W. Peacock, 1795 To which is added, "A Chronological Table from the Creation to the Present Time; a Monthly List of All the Fixed Fairs in England and Wales; and a Table of Coins of the Various Nations, and Their Value in English Money. To this whole is prefexed An Introduction, Exhibiting a View of the Newtonian View of the Planets &c." 3 1/2" X 5 1/4" , no pagination. 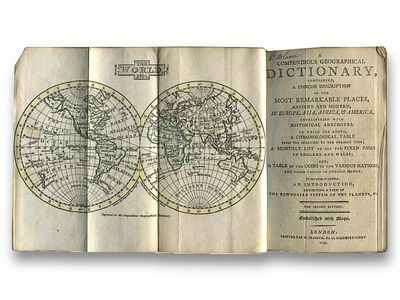 With colored outline fold-out maps of the World (frontis), Europe, North & South America, Africa, Asia and the Solar System, no map of South Pacific or sign it was ever there. Truly everything you needed to know in 1795. The text is complete except that two pages, the half-title and frontpiece, appear to be missing, text is unmarked, and pages tight. Previous owners' names on flyleaf and title page. Endpapers are marbled. The front board is missing and the back is detached. The spine is "poor" with 1/2 of the leather missing. There are traces of gold stamping on the remaining brown tree calf boards. 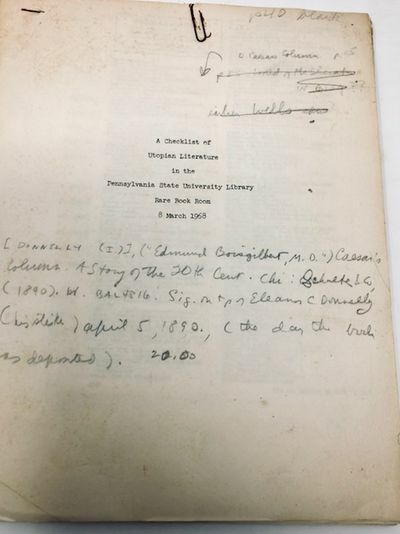 Previous owners' names on inside of flyleaf and title page. Inside the frontpaper is a small stamp of recent vintage ".Wood & Co. Binders", but no sign any rebinding was attempted. Size: 24mo - over 5" - 5¾" tall. Second Edition. Full-Leather. Fair/No Jacket.. Second Edition.. Hardcover. Fair/No Jacket. Tokyo, Japan: Kantosha, 1956 Tokyo, Japan: Kantosha, 1956 Two volumes cased in cardboard, Volume I has a large foldout illustration of the anatomy of an airplane, photo illustrations of aircraft in three seperate views throughout, Maps on endpapers. Text in Japanese. Volume II has the English translation. Text is clean, tight and unmarked. . Red boards are clean and undamaged. Tanheavy card casing has light soil, sunfading. Cased Hardcovers. Very Good/Good.. Hardcover. Very Good/Good. Dust jacket present. Washington D.C.: Office of Armed Forces Information and Education Department of Defence, 1952 82 pp with B&W photos and illustrations. Text is clean, tight and unmarked. Green and cream paper covers with drawing of two Japanese children are intact but lightly soiled, dogeared.. Paper Wrappers. Good. Washington D.C.: Office of Armed Forces Information and Education Department of Defence, 1952 Washington D.C.: Office of Armed Forces Information and Education Department of Defence, 1952 82 pp Designed for occupying American Forces. .Largely about Japanese culture and acceptable behavior.text is clean, tight and unmarked. Covers are rubbed and faded. Stapled Soft Cover. Fair. 4" x 5.5".. Hardcover. Fair. 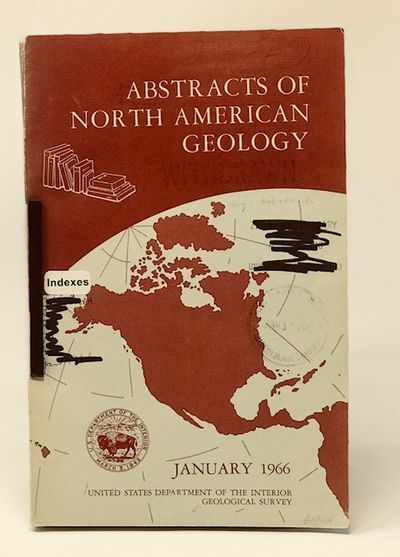 United States Department of the Interior Geological Survey, 1966 Texts are clean, tight and unmarked. Covers are undamaged, faded along spine.. Soft Cover. Very Good. Rambir Government Press, 1945 Rambir Government Press, 1945 Annual administrative report handsomely rebound in tan calf. Text is clean, tight and unmarked. Charming child's drawing of a horseman and the Buddha on final free page. Title page is missing. Interesting for the details of how the state was managed under the British. Hardcover. Very Good/No Jacket. 8vo - over 7¾" - 9¾" tall.. Hardcover. Very Good/No Jacket. Rambir Government Press, 1941 Rambir Government Press, 1941 Annual administrative report handsomely rebound in tan calf. Text is clean, tight and unmarked. Title page has liquid splash marks. Interesting for the details of how the state was managed under the British. Hardcover. Very Good/No Jacket. 8vo - over 7¾" - 9¾" tall.. Hardcover. Very Good/No Jacket. 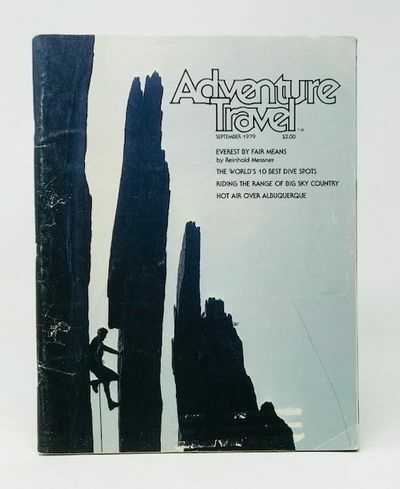 Seattle: American Adventurers Association Seattle: American Adventurers Association Issues September 1979 and August 1980. Contain interviews with Ansel Adams and Reinhold Messner on his Everest climb, also ballooning over Albuquerque, and big ice climbing. Soft Cover. Good +.. Paperback. Good +. Seattle: American Adventurers Association, 1980 Seattle: American Adventurers Association, 1980 Issue for August 1980 . 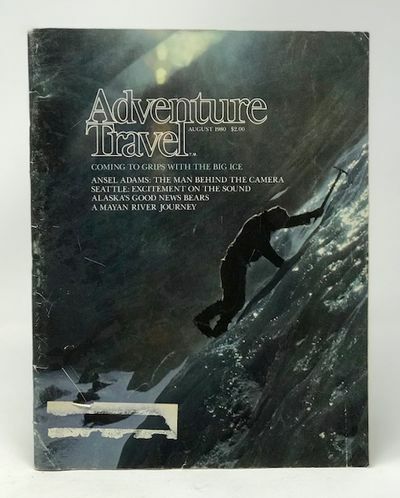 Contain interview with Ansel Adams and a discussion of ice climbing. Soft Cover. Good +. Magazine.. Paperback. Good +. Mitchell Air Force Base, NY: Continental Air Command, 1949 Mitchell Air Force Base, NY: Continental Air Command, 1949 Text is clean, and tight with some occasional underlining in pencil. "Advanced Arm. Officers Course" stamped on first free page. Blue cloth boards are clean and intact save for some rubbing to extremities with no loss of material. Hard Cover. Very Good Plus/No Jacket. 4to - over 9¾" - 12" tall.. Hardcover. Very Good Plus/No Jacket. 1944 1944 64 pp with B&W illustrations throughout. Text is clean, tight, chipped along edges. Covers are edgeworn. Soft Cover. Good.. Paperback. Good. Central African Division Air Transport Command, 1945 Central African Division Air Transport Command, 1945 48 pp with B&W photographic illustrations on every page. A pictorial account of the supply flights from Accra to Karachi during WWII. Text is clean, tight, slight foxing, slight yellowing. Beige cloth boards are clean and undamaged. DJ is another story, intact but soiled and chipped. Now in protective mylar. Hard Cover. Good/Fair. 7.5" x 10".. Hardcover. Good/Fair. Dust jacket present. U.S. Government Printing Office, 1943 U.S. Government Printing Office, 1943 34 pp. Text is clean and tight, the largest map has some fraying along exposed edge. Covers are stained and soiled . 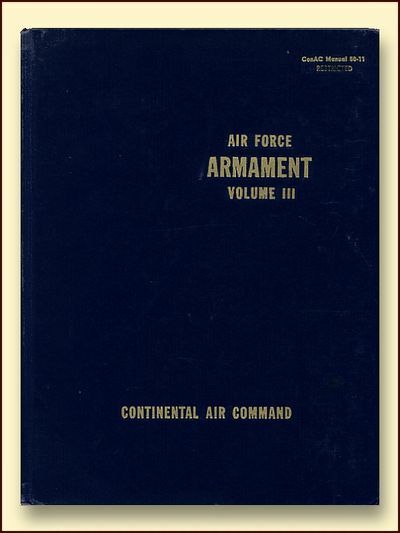 Cover states: "This document contains information of value to the enemy. It will be distroyed if in danger of falling into enemy hands." Consists of map and arial pfotography of the area. Worldcat shows only one copy in US libraries.Between April 1943 and July 1943, the Allied Geographical Section of South West Pacific Area (command) conducted reconnaissance after the Japanese invasion. The Terrain Handbook states at page 18;"Nazdab is located twenty-seven miles NW of Lae by road 900 yds by an indefinite width. Covered with Kunai grass. Good dispursal area. Emergency landing ground for heavy freight planes. Extension to 2000 yds thought possible".The Landing at Nadzab was the first parachute jump for the 503rd Parachute Regiment on 5 September 1943. In conjunction with the Amphibious Landing East of Malahang, was to be the start of the liberation of Lae from Japanese Occupation.On 8 September 1943, MACARTHUR'S communique states; more than 60,000 rounds of ammunition, silencing artillery positions and destroying installations at Gabsonkek (21 miles north-west of Lae), Munum (six miles east of Gabsonkek). Yalu, Nara kapor (14 miles North west of Lae), and Labu Island (60 miles south-west of Lae. After the landing, the 503rd Headquarters Company established themselves at the Gabonkek village and it was at this time that the descending wildcat logo became their official insignia. On September 19, 1943 the Gabmatsung Lutheran Mission was converted into the 2/4th Australian Field Ambulance main dressing station for the 7th Australian Division. Size: 5" x 7.25". Soft Cover. Very Good.. Paperback. Very Good. Harry Abrams, 1982 Harry Abrams, 1982 Published in conjunction with the exhibition of the same name at the Metropolitan Museum of Art, New York 1982. 223 pp. Color and B&W illustrations plus maps. Text is crisp, clean, unmarked. grey cloth boards are immaculate. DJ, protected by a mylar cover, is bright and undamaged. Size: Folio - over 12" - 15" tall. Hard Cover. Fine/Fine. Folio.. Hardcover. Fine/Fine. Dust jacket present. 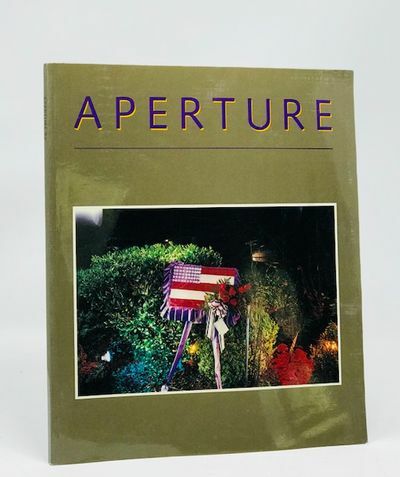 U.S.A.: Aperture Book, 1988 79 pp. Text is clean, tight and unmarked. Covers are bright and undamaged.. Large Format Softcover. As New.